...made by Chris Hernandez in the USA, and not Ben Fletcher in the UK. What a job on screening there! Thank you Roman - I like to think I do a nice job with the screening, and nice for it to be appreciated. In fact the strips of foil running out to some of the screws has the idea that when the scratchplate is screwed down, it will make for a firm contact with the copper on the back of the plate at the screw positions. So I'm not really thinking about earthing the screws, and more about making the "cage" as good as possible. But is it necessary? and does it make much difference? - answer is I don't know, but it's just become a thing I always do, and it does no harm anyhow. Ah, I misunderstood the intention! Are you screening the signal wire going from the main cavity to the jack cavity? Or twisting it with ground wire is sufficient? It must have been you who told me that braided copper sleeve is used in drilled tunnels for that. I use screened cable for all my signal wiring on my builds. Search really works on this forum! ...on wiring runs between cavities I run the wires inside a braided cable shield and solder each end to the copper foil in the cavities. Hey. Why don't we all get together and build one huge, final Strat ? A Strat to strat all Strats. 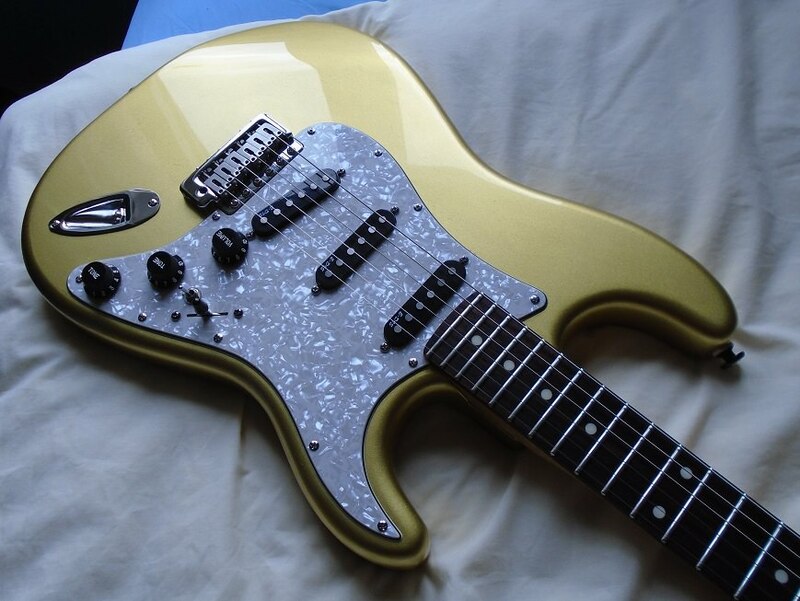 I'd love to build another Strat, but now I have to survive on a pension I am afraid there are other priorities. I also wanted to build a bass, based on a Tele body, but that died in the womb too! Erm - probably I will use a short length of screened cable from the control cavity to the jack, but I won't bother to shield the jack cavity. I've done that in the past, but more recent experience (wiring a semi-acoustic) leads me to believe that it make no perceptible difference, and it's a bit of a faff. Currently languishing unfinished... - I suppose it's evidence that it's much easier to build from fresh using nice brand new parts, rather than "doing up" an old tatty-looking guitar with issues. There was a layer of some kind of epoxy-like material on the tele body which proved impossible to remove cleanly, and I guess I gave up with it. I may try again at some stage, but I didn't think it was very high quality in the first place, and maybe not worth the effort. "One last project" indeed lol. Have been playing the guitar acoustically for a couple of days, and it's a good 'n', you can tell with these things. I guess with the alder body, rosewood board neck, and vintage wind pickups, this build will be more of a classic strat than my other two (one being an ash body/ebony board/Lace pickups and the other a walnut body with hotter wind pickups). And I plan to keep it like that, for when I just want those famous strat tones. Also, earlier than expected, a package all the way from Croatia, yay! Just some more pickup pictures - lovely purply-brown plain enamel wire. Also they look meticulously well made, which really gives confidence, and the whole package is very well presented, which helps give a good feeling too. Soldering begins tomorrow, when I'm ready to concentrate - I find evenings are not the best time to start a soldering job. But I will at least draw up my diagram to work from tonight. Connect earth wire to trem claw to make sure the strings and all that metal stuff is earthed - the other end of this wire is just soldered to a suitable spot on the copper shielding, which makes life easier if I'm doing any further mods to the wiring in the future. Fitted a Graphtech string tree - had to buy a pair, but only used one. These are really just molded plastic (albeit "special" plastic) and a screw, about £9 a pair from Strings Direct. But it is working well, and looks smart, and I like the eye-like appearance. After cleaning the fingerboard with naphtha, then nourishing the wood with a little almond oil, it turned noticeably darker. You can't see the variation in the grain as well, but it does look like (and I think is) high-quality, dark, Indian rosewood. Perhaps it was a bit dry before, although it didn't really look it. First time I've seen such a visible effect just from the almond oil, and I'm still using a small bottle of that, which I got in the late 1980s! What does it sound like, I hear you ask - well a) lovely, and b) not quite as I anticipated. It has a sweet, warm character, and no trace of the icepick harshness strats are sometimes accused of. The detail and nuance is there also. The series options work well too, and are very useable sounds, and it's easy to access them with the mini switch - if I back the volume off a bit, they are actually not that different to the standard strat sounds, and they get a bit fuller sounding with the volume on 10. I don't seem to be getting as much of the quack/scooped effect in positions 2 and 4 as I anticipated, although there is some - in general, I prefer positions 1, 3 and 5 - maybe that's just how my taste is though. Also maybe just a tad more top end brightness would be welcome in general (not that the guitar is at all dull-sounding or anything) - so I'm thinking I may change the tone pot to a 250K no-load type. I could put in a 500K volume pot also, if necessary, but I think I'll see what the change is with the tone pot first. Looks nice. I, however, would have gone for a screened connection to the jack. You wouldn't use a twisted pair from the jack to the amp! I haven't noticed any noise at all from the guitar in testing anyway. But yes, obviously wouldn't use a twisted pair from jack to amp, can't argue with that. Another mod I may do in the near future is to fit a better quality Switchcraft or similar jack, so I can take your advice and use a bit of shielded cable when I do that. Just caught up with this. Wonderful work there young man. I think like all guitars, you tweek as you go and find what it is about that particular guitar that stands out (they all have thier special tone IMHO). After a few months playing, it will be better because you just learn to optimise it with your hands. I might add that because my old strat has naturally rounder/worn fingerboard edges, I tend to do a little of that to my newer guitars too. That said the binding on the 335 is not so easy to get it right without risk of flaking the finish over the top of it. Anyway I'm suitably jealous of the guitar/you. Thank you ES - I do agree very much with what you say re guitars - time makes a difference, and one has to allow for that. FWIW, I think my nigles with this new one are related to how to set up my amplification - i.e. Helix and FRFR cabs, which is stuff I've also been learning about, and adapting to over the last few months. So a period of relative stability re guitar kit in general would be a good thing. But I am very pleased with this new guitar all the same - took it to a jazz gig yesterday evening! It did pretty well, and got a few admiring comments. Lovely job Megi. All together the finish and choice of plastics is fantastic. Gorgeous! I was interested to read your review of the sounds. Have you narrowed it down to two or three faves yet? How much do you adjust the series knob, or do you leave it as is when switching? Could the quack be improved by lowering the middle pickup? Just looking at the wiring diagram again and thinking how much sense it makes now. I was a bit confused at first, but now I can see that flipping the switch just gives you the option to dial in the middle pickup in series, AND you get neck and bridge together (my favourite). I have one strat type thing that has a series switch that turns the five way into a three way - neck + middle in series , nothing, bridge and middle in series. I quite like it. How do you like the neck and bridge with middle in series? Thank you kindly! I am very pleased with the looks aspect in general. Re sounds - I do like the 3 individual pickup sounds, and in normal circumstances I could happily live with just those. With the series blend, I guess my normal modus operandi will be to have it turned all the way up all the time, so that I just have to flip the mini toggle to get an instant thicker tone with volume boost. But I do still have to properly experiment with the blend function, and there might be nice things to be had from that. All the sounds are very usable though - no duff ones, and if I find myself in a venue where single coil noise is a big problem, then it's got to be useful to be able to switch the guitar into series humbucking mode - I'm sure I could do a gig like that happily enough also. Could the quack be thus improved? - I don't know, being clueless about such things, but it has to be worth a try, and thanks for the idea! Yep - it made sense to me also, and still does now I've done it. For my money, any wiring scheme needs to have a logical operation, and be easy to remember, and this is good for me. Neck and bridge plus the middle added in series is OK - it's kind of like the middle position on a humbucker guitar, but actually there's just a bit of stratty quack in there also. I think I prefer n+m and m+b series combinations, but still good to have it. I've heard a lot of people say they like n+b better than middle on it's own - for me I'd have to say I like the middle on it's own better, but of course it's taste, and it's still good to have the n+b as an option - kind of a tele-ish tone I'd say, and could come in handy, who knows. Off very shortly to another gig with the guitar, where I am required to impersonate a blues guitarist. I'm just going to have fun and hope no one notices I'm more of a jazzer by inclination. WOW - a three page thread to catch up with - you have been busy the last few months while I've been elsewhere having "fun". I've just arrived in time for the completion of the project, and it took a bit of time to read through it all, and I have not been able to fully digest it all. But here's some thoughts FWIW. What is obvious in my view is that yet again you have produced a diary of a build that highlights your qualities of research, inventiveness and skill at putting a quality guitar together. A quality 2 piece solid alder that is nicely resonant is a great starting point, and your thoughts on not scrimping on the neck are very wise. A Tru Oil finish on the neck ticks the right boxes too I think. I don't pretend to understand all of the implications of what the wiring diagrams represent. I saw in the original plan that wiring meant the bridge pick-up would have tone control and that for me with a strat is a big plus. Without it I find many strats are unusable with bridge pick-up only, unless I want my ears to bleed. I think the later wiring plan means you still have that tone control over the bridge. Funnily I wasn't convinced with the look of the picture with just the pick guard on the body. But the later picture with the pick-ups and hardware in the combination looks fine after all. I've never installed a nut on a guitar, just files string slots on existing ones, but if my filing down of new bone saddles for a couple of acoustic guitars are anything to go by I can understand it being time consuming to do the nut. Having to initiate the string slots and not just amend them sounds a bit tricky too. But if you can do it right it at least means you get a nice set up down at that end of the neck. Getting that quality steel block on the trem unit is a great idea - that block does seem to have a big effect on sound / sustain. You commented that the guitar sounded good acoustically. That must have been encouraging. I've usually found that the better acoustically sounding electric guitars have also been the better ones plugged in too. The demos of the E-dis pick-ups sound very good. I notice on their website they are very coy about prices. Is it pretty decent value for money? You make a really good point about vintage staggered pole-pieces. Vintage ain't necessarily a good thing if other aspects of the guitar (like the types of strings) are no longer vintage. It just ends up traditional for the sake of it. The descriptions and sound samples seemed to me to make the Vintage option to be a good choice. I see you mention there is no icepick harshness which a big plus in my books. I think I'd prefer a set of pick-ups tending a bit towards warm and tweak the top end if needed rather than the other way round. Very well done on this project Graham! Hopefully a success that makes all that work you put in to be worthwhile! Hopefully on your next project (surely there will be one some day) I'll be able to follow it as it happens. Fender have started to include the tone control on the Strat Bridge pick up too. My 2010 has it, and a mate has a slightly earlier Strat with the same. Must be a demand for it. I noticed recently that the new Fender Player series that replaces the MIM series now have the tone control for the bridge as standard. Re the body and neck choice - a bit of a risk buying via the web, but it's the only practical way. In a way I'd want to look at the body wood, but can't since it had the gold paint job - but it seems resonant, so lucked out there. As to the neck - I was initially looking at some cheaper ones from an ebay seller, which were probably not at all bad, but the Allparts one I bought for £50 more is superb, with obviously high quality woods, and I think after a while the extra spend is forgotten, but the appreciation of the quality lives on. Re tone control for the bridge - yes, absolutely agree, I couldn't live without that. I'd be perfectly happy with just a 5-way switch and master volume and tone on a strat, but there's that extra pot there, so it's a case of do something interesting with it. Part of the charm of the design for me really. Re looks - I wasn't convinced either, but just carried on and hoped it would work out, I still think it's a tad gaudy from time to time. I think you're right that the hardware and pickups do make a difference. But also there's a bit of me that likes the bling aspect, so it's an honest reflection of the maker in that sense, and I do think it works overall. Re the Wilkinson trems - you can buy them with a decent cast steel block, and I suspect it's just a small difference made from the posh rolled steel one I fitted. A case of using it because I could I suppose. Maybe just a tad more high end and sustain, but I wouldn't like to be put to a blindfold test. Re the nut - yes, a series of challenges for me to make one from a solid block of bone, so it ended up being a case of tackle each tricky job one by one, and that meant it happened over a number of days. I got the nut slots right by finding a printable string spacing rule on the web, then cutting a section out with scissors and gluing that in place on the top of the nut. Then I could see exactly where to start each slot. What a faff, but it worked in the end. The E-dis pickups were around £75 including postage - I got them via an ad on ebay, which did seem more straight forward a way to buy at the time. Considering the obvious build quality of them, I think a huge bargain. If I wanted any more in the future, I'd probably use the website. I think what I liked on the demo videos was that they had a vintage/authentic kind of tone, but also a fullness/sweetness/warmth and that kind of singing, voice-like aspect. And I think, having now used the pickups myself, that I wasn't wrong about these things - they have the crisp clarity and zing you'd hope for from strat pickups, but indeed no trace of the dreaded icepick harshness. 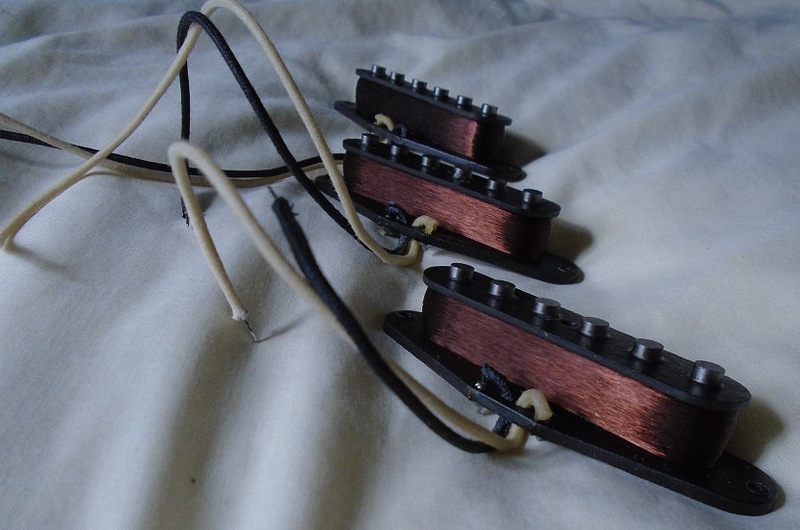 If you ever do find yourself looking at buying strat pickups, I think you'd like these from what you say. Again, do appreciate your time looking through the thread, and considered comments, all the best Mark! It was a shame I wasn't around to watch the project as it happened, and I thought it only fair with the amount of work that you'd put into the thread that I should give it a serious read. From what you've said, what I've seen, and what I've heard on their demos the price of the pick-ups seems very reasonable indeed. As I know from your previous pick-up recommendations there are value for money benefits to be gained from avoiding the big name brands. 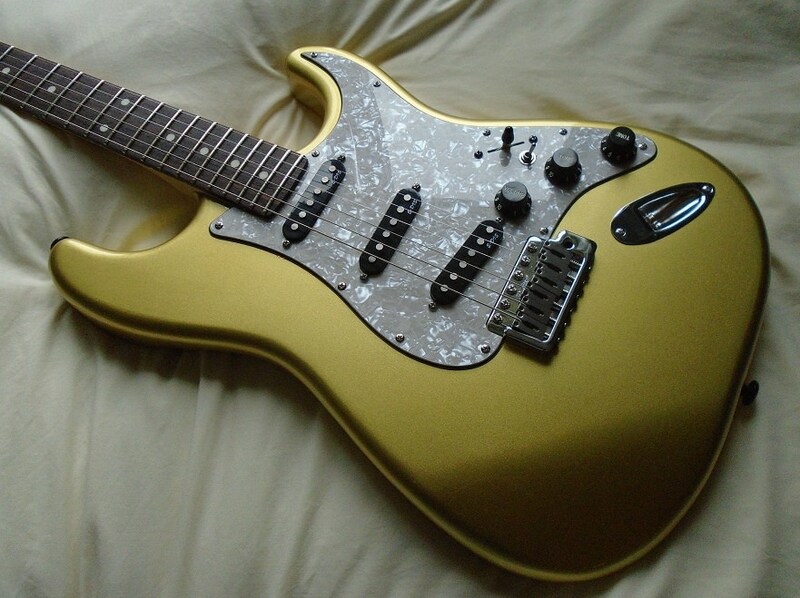 Fullness, sweetness and warmth are the sort of virtues I'd be looking for in strat pick-ups. Not that I'm able to play my electrics at the moment - they're in storage pending a house move, the success of which is proving elusive. Reading your thread did make me miss them for a while. I recall the difference on a strat trem between a decent cast steel block and a cheap lighter weight one - a very noticeable difference. Makes sense to me that if you had something that might make it even better you'd use it. I hope you have many years happy playing with this one.